What is a ”Poker Run”? A Poker Run is not a race. It’s a game of chance and an assembly of some of the hottest boats in the Midwest. Local owners who just want to run their personal offshore boat with the big rigs will also be on hand. Even before the actual event begins, you can sense the anticipation. Like all boaters, Poker Runners are itching to head out on the open water. Sure they love the attention their sleek, super-fast water warriors bring them. Sure, they listen carefully to important details outlining proper conduct, safety and rules of the road at the driver’s meeting. But, they just can’t wait to greet the waters of Lake Michigan. A Poker Run is fun on the water with power to burn. It’s a few glorious days of performance boating at its finest, a chance to renew old acquaintances and make new friends. Each participating boat navigates a carefully charted course, stopping at five checkpoints along the route to pick up a sealed envelope containing a single playing card. At the Saturday evening party, the cards are played and the crew holding the best poker hand is declared the winner! There’s an unquantifiable joy in feeling the wind whip your face on the open water and experiencing a roller-coaster-like ride over wakes and waves. But signing on for a Poker Run also means being part of a well-organized, activity-oriented, fun-filled safe event that benefits the children of Camp Quality and Challenge Mountain. 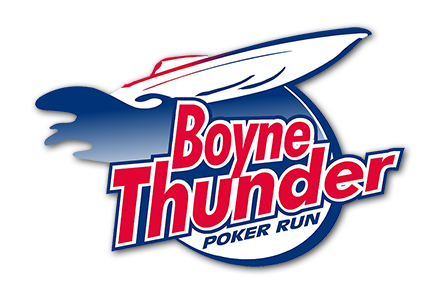 Downtown Boyne City celebrates the Boyne Thunder Poker Run beginning Friday evening from 6:00 – 9:30 p.m. with “Stroll the Streets,” a street party with a collage of music, entertainment, dining, shopping, boat displays, and a car show. Boyne City rolls out the welcome mat to all boaters, visitors and residents for the evening in the heart of the downtown district.